Don’t you hate when you get out of the shower and the mirror is all steamed up? and then you wipe it off and it is streaked? I found this Fogless Shower Mirror by ToiletTree Products that I just love! The first thing I was surprised at with the Fogless Shower Mirror is how light it was. It comes with both a stand and with removable silicone adhesive and double sided tape to mount to the inside of the shower. I think this would be such a great Father’s Day Present. Dad can now shave in the shower. Think of the time and mess it will save. You can use it to tweezing your eyebrows. Fogless Shower Mirror is a great addition to any shower or bathroom. How does the mirror stay fogless? Simply slide the mirror off the bracket before each shower and fill with hot water. The hot water will keep the mirror the same temperature as the environment in your shower which makes it scientifically impossible for your mirror to ever fog. Filling the mirror each shower takes 5-7 seconds. 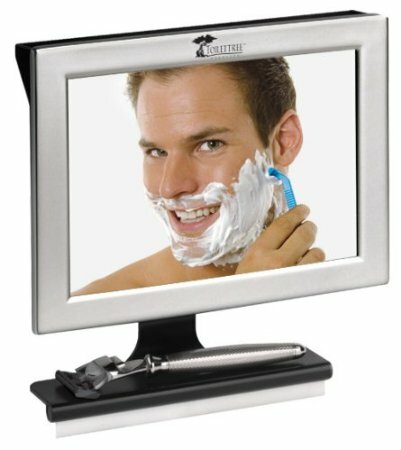 What other features I love about this mirror is that it is shatter proof, easily adjustable bracket to accommodate multiple users, built in shelf to store your razor, sponge or tweezers, squeegee included to wipe away excess water drops, and it measures 8.5in x 6.5in x 1.5in. If you would like to purchase your own Fogless Shower Mirror from ToiletTree you can go HERE and order today. ToiletTree has also offered one of my readers a chance to win their own Fogless Shower Mirror. You must be 18+ and have a US shipping address. Leave a comment on who you think would use the Fogless Shower Mirror the most. Extra entry for following ToiletTree Products on Facebook. Extra entries for each way you follow Kaisy Daisy’s Corner. Giveaway ends Jun 12, 2013. This would make the perfect Father’s Day gift for my husband, he is always shaving while taking a shower. My husband would really be able to use this everyday! With the warm showers and shaving everyday, this would be perfect for him! Everyone in the house would use it. We like a steamy shower. My hubby would love this, making shaving easier. my oldest son would use this alot. My fiance would use this the most! Thanks for the giveaway! My husband would love this! He’s always taking super hot showers and I get a little upset when he wipes away the steam off the mirrors. It always leaves a streak and I have to windex as soon as he’s done. My hubby would get the most use from this. What a great gift for Father’s Day! I would use it for myself! This is a great tool! My son would use it the most. I would get the most use out of this!! I think my father or my brother would use the Fogless Shower Mirror the most.